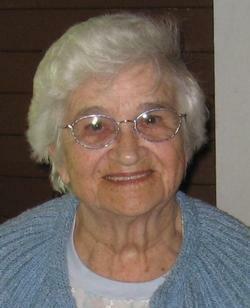 Ida D. Miller, 95, of Babbitt, passed away on Thursday, August 31, 2017 at Ely-Bloomenson Hospital. At her request, there will be no funeral service. Private family burial will be at Argo Cemetery in Babbitt. Arrangements are with Range Funeral Home in Virginia. To sign the online guest book or to send condolences, please visit www.rangefuneralhomes.com. Ida DeMers (Dee) Miller was born on July 18, 1922 on her family farm in Spirit Lake, Iowa and passed away surrounded by family on August 31, 2017. Dee grew up in Spirit Lake and lived with her parents, Albert and Florence Trickel; grandparents, uncle, brother Eldwood, and sister Shirley, who are all deceased. She was named after her grandmother, Ida DeMers Trickel. In her teenage years, the family moved to the Park Rapids area where they farmed and Dee attended school. She met her husband Vernon in 1941. He joined the Army and was sent to California for training. They moved to California and married on July 18, 1942, two weeks before Vern shipped out to the Pacific theater in WWII. Dee remained in California while Vern was overseas. She did her part for the war effort as a “Rosie the Riveter” by welding in the shipyards in Oakland while waiting for Vern’s return. After Vern was discharged from the Army in 1945, they returned to Park Rapids, where they worked various jobs, managed a restaurant, and had their first son Michael. Next, they moved to Chicago where Dee put her welding skills to use at the Schwinn Bicycle Plant. Their second son, Randy was born there. They then relocated to Minneapolis where Dee worked in a department store. From there they moved back to Park Rapids to give farming a try. Their third son, Steve, was born there. A few years later, they heard of an opportunity to work at a mine and live in a brand-new community with a brand-new home. They moved to this community, Babbitt, in 1955 and bought a house on Hemlock. Their 4th son Greg was born in Winton. Vern worked at Reserve Mining Company and Dee was a homemaker and a mom, no easy task with 4 busy boys to raise. They moved to their new house on Cottonwood in the 60s. They enjoyed camping, fishing, and snowmobiling. In their retirement years, they traveled and spent winters in Arizona and Texas, enjoying motorcycling, bicycling, and traveling to Mexico. After her husband passed away in 2003, Dee continued to live in her home until she turned 90, mowing her own grass and shoveling her driveway. After suffering from a stroke in 2012, she moved to Assisted Living, first at Scufsa’s in Ely and then at Carefree Living in Babbitt in 2015. Dee had an endearing sense of humor and wit and will be missed by all who knew and loved her. Dee is survived by her sons Mike (Judy), Kennewick, WA; Randy (Desiree), Costa Rica; Steve (Deb), Babbitt; and Greg (Connie), Concrete, WA. She is also survived by her grandchildren Ryan Miller, Adam Miller, Ashley Ward, Regina Groth, Misty DeWispelaere, Kelly Van Damme, Brandy Reece, Jason Miller, Vernon Miller, and Travis Miller, as well as 14 great-grandchildren.